As a valued customer or referral source, you are very valuable to MyShape Lipo and we would like to show you, not just tell you. By earning points you will have the opportunity to use your rewards for savings on future procedures. For every dollar spent you will get a point. If you have had your procedure already you will earn points twice as fast. These rewards will be awarded upon full payment of your procedure and may not be used towards your deposit. You must have the required points or more accumulated to redeem a reward. These rewards are to be used for discounts off liposuction procedures. You will only receive reward points for the referral’s first procedure. If the person you refer gets multiple procedures, you will only earn points for their first procedure. The person being referred must validate that they are being referred. Hence both people must agree to the referral. Referral points will only be earned once the procedure has been performed. You earn points after your procedure or you earn points after the person you refer completes their procedure. It is the patient’s and the referrer’s responsibility to verify reward points prior to the procedure, there will be no retroactive rewards issued to people claiming to have referred an individual 24 hours after they have had their procedure. Points will not be allotted until the procedure is completed. Rewards may not be used for deposit or portion of deposit. Rewards points will be awarded for liposuction, Smart Lipo, Fat Transfer and Venus Legacy treatments. 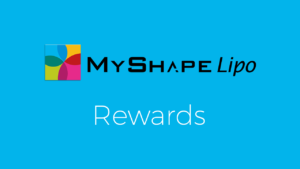 Rewards will not be issued for fees associated with revision procedures unless it is a revision of previous liposuction from another doctor, not treated at MyShape Lipo. May not be used with any other offers, specials or promotions.